My first national radio award! The radio station is on a roll! We've won another batch of awards. First, the Atlantic Regional RTDNAs, then the Atlantic Journalism Awards. Now we've been honoured at the national RTDNA convention in Toronto, and I'm proud to say my work was involved in both. 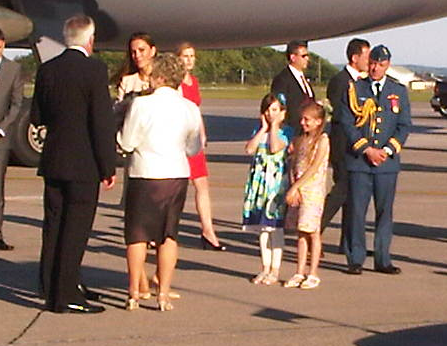 Here's the piece that won the Short Feature award -- coverage of the royal visit to PEI last summer. I was also at the Halifax Shipyard when Irving was announced as one of the successful bidders in the National Shipbuilding Procurement Strategy. It was an exciting night, and colleague Amy Arts and I both worked hard to get the story as it happened, and leave behind a lot of good material that contributed to the Best Newscast (Medium Market). Kudos to all my colleagues at News95.7 and across the green-brand chain. Saturday night in Toronto, The Radio Television Digital News Association of Canada (RTDNA) awarded News95.7 Halifax two NATIONAL radio Awards. News95.7 was awarded the Byron MacGregor Award for Best Newscast (medium market) in Canada. This newscast, which aired at 8 a.m. on October 20th, followed the announcement that Halifax's Irving Shipbuilding was getting the $25-billion contract to build 21 Canadian combat ships. It was team coverage at its best. Congratulation to morning anchors Dan Ahlstrand and Erica Munn – News Editor Ruth Davenport who quarterbacks our news coverage each weekday morning…and reporters Desiree Finhert, Scott Simpson and Amy Arts. Sports with Scott MacIntosh, Traffic with Sean Smith and weather with Meteorologist Richard Zurawski. News95.7 was also awarded the Dave Rogers Award for Best Short Feature for Scott Simpson’s story on Will and Kate’s visit PEI. It was a terrific example of Scott’s unique and colourful story telling abilities as he interviewed with a young local girl who had a chance meeting with the Duchess of Cambridge, Kate Middleton. Interviewing children isn’t always easy; But Scott was able to turn it into an engaging and delightful story.